I just love this online sewing community, new things are always happening and more resources available to us. Take this new site, Indie Sews, it has so much right in one spot for us. Yes, you can buy Indie patterns there, like the Summer Concert Tee which I purchased and downloaded this week. I like you can read more about the pattern, see the details and find reviews about this pattern right on one page. Style guides for each pattern now that is fun, ways to wear your creation. Then you can upload your creation to the site, so much available in one spot. Now let's talk about the Summer Concert Tee, this is an loose fitting tee, with a beautiful scoop neckline, dropped shoulders, hi-low hem and sleeve bands. The fabric is an ITY knit from Fabric Mart. I know I just talked about the need for natural fibers in Missouri. Well, I made an exception for this shirt, the loose fitting style makes the ITY knit acceptable for this. This style is quite different from my usual garment but I have seen such great garments from this pattern, I had to try it. I did do two changes - added 2" to the front and the sleeve band I folded in half to make the sleeves a bit shorter. I wanted shorter sleeves for summer. I cut my top between the small and medium but will got down to a small next time. I am very excited about Indie Sews, just the thought of independent patterns in one sport makes me excited but all the extras there make me super excited. I was asked by Indie Sews to help get the word out about their site but it was all my idea to purchase this pattern. I had been at the site several times before I was contacted and loved all the content available. I hope you will enjoy it, too. Thanks, Patty, it is comfy and cool. Love this, so cute and modern. Not all boxy like most. I just signed up on their blog, and will be purchasing some of their patterns really soon. Thanks for the information. That gathering knits using floss is such a great idea and tutorial. Very pretty top, Lori! I will have to check out that site, as I have seen a few posts about it. Thanks, Stacy, a fun new site for sure. Very lovely top. It looks great on you. Thanks so much, it was fun to make something not loke my usual style. Such a cute top! I will be checking out the site for sure! Thanks so much, have fun checking out Indie Sews. 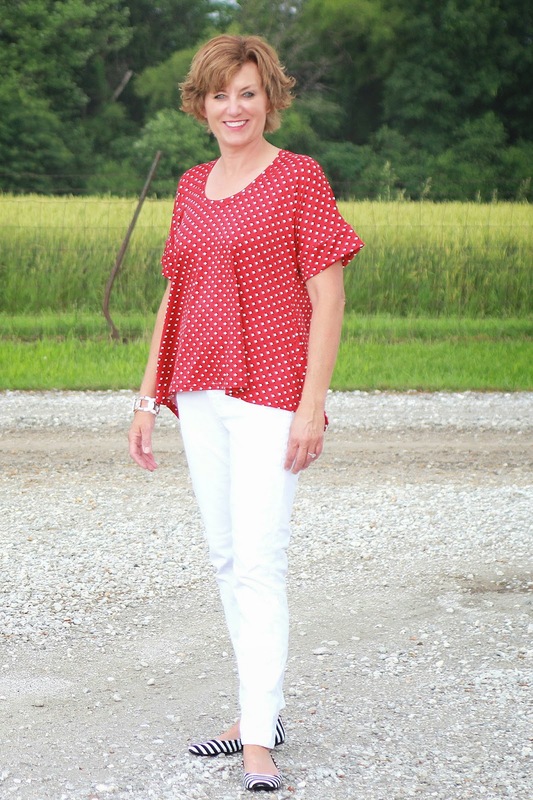 Easy breezy looks good on you Lori! Thanks Faye, it is easy for sure. Super cute top! Perfect for summer. Thanks, Sharon, it is just right for summer. That is very cute on you! 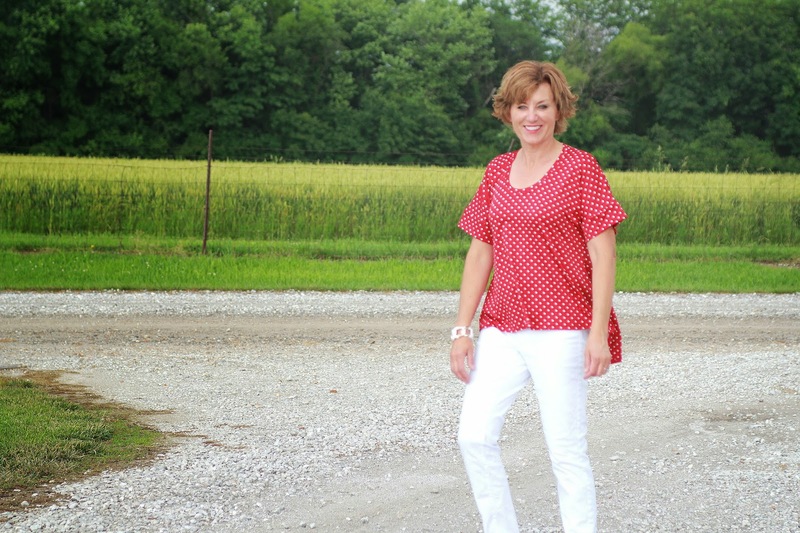 I love the red polka dot fabric. I made a top out of that pattern using "sparrows in the woods" knit from Girl Charlie. 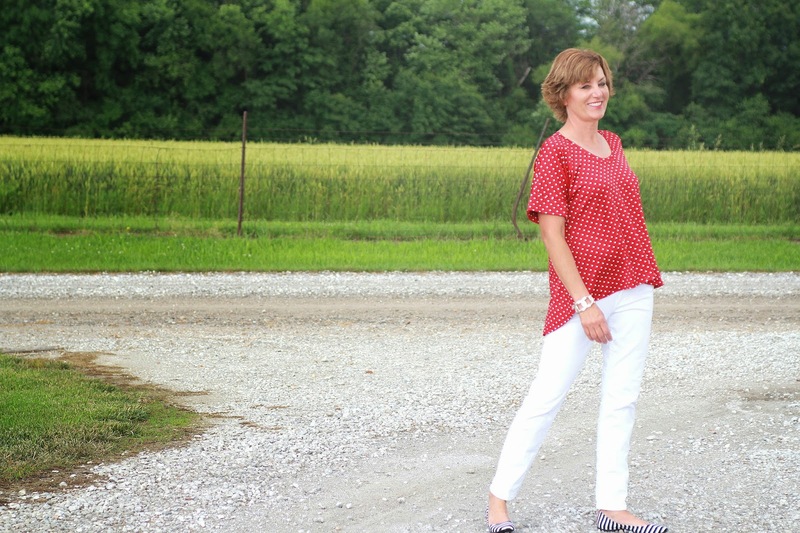 Extremely easy pattern to make, super comfortable and cool in the summer. I'm going to make a couple more!!! It is such a winner and worth multi-makes. Your top sounds great and don't you love Girl Charlee knits? Another cute top. The changes you made to this pattern are definitely you. It looks great. Thanks for the info about the site. I'll check it out! Thanks, Terri, isn't it fun to make a pattern just right for you? You are making some really cute tops! Thanks, Dorothy, it sure makes it fun to decide what to wear in the morning! Married to Mike and mom to 4 incredible, marvelous, wonderfully talented girls (4 son-in-laws, too) and now a "nana" to three cute little guys and two little girls. I have been sewing since 7th grade and continue to have a passion for creating garments. Join me on my sewing journey.